Removing rust is often a time-consuming and annoying job. 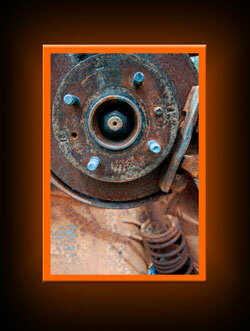 Rustyco makes removing rust a piece of cake! Sand blasting (grit blasting) is another common method for removing rust. This is done in special booths and is a highly specialist job. Rustyco is an easier and cleaner answer. It is liquid sandpaper! Rustyco removes rust from metal objects such as old coins, clocks and historic tools, without having to sand or blast. Rust on car parts, your boat or motorbike parts are also easily removed with Rustyco!